The Replicator 2 has been around for a few years and has assisted in the commercialization of the MakerBot Brand. MakerBot’s success in making the Replicator 2 the go to product for small design houses and enthusiasts interested in 3D printing helped MakerBot become the acquisition target of the 3D printing powerhouse Stratasys . While many in the 3D printing community may bemoan the loss of this icon as MakerBot kills off the low-priced Replicator 2 in favor of the 5th Generation MakerBot Replicator. Most will agree that it was inevitable that this would happen as MakerBot continues to grow into a more mature business and away from the hacker roots where it found its beginnings. The reasons for the change are many such as the move from standard hardware store components to proprietary extruders and the move towards cartridge based filament with its new thinner spools for the 5th generation units. The new units will have less hackability which while bad in the eyes of the maker community may prove beneficial for the larger market that MakerBot is positioning it’s self to dominate in the coming years as 3D printing becomes a more mainstream concept. I believe that the 5th generation MakerBot Replicator may run the risk of being like Windows Vista. Full of new ideas, pricy, and overwhelmingly skipped over by the market at large in hopes that the next version delivers on the promises made by this generation of the product. I feel we are in between the time when a 3D printer is as easy to use as a toaster and the time that it is an unruly hobby for people who like to tinker with machines. The new tech is emerging that will make this easier for a home user but is not yet ready for the big leagues. For those of you that are planning to skip “Vista” and and install “XP” instead, there are still a few MakerBot Replicator 2’s available over at Amazon.com here: MakerBot Replicator 2 Desktop 3D Printer Otherwise lets wait for “7” to save us all. Thank you makerbot you greedy bastards, time to move on to a new printer manufacturer. Your 5th gen machines are garbage. The Replicator 2 has been working for me with no problems. Let me guess, now you will no longer source parts for the machine and force people to look into your overpriced crap with more expensive plastic with less volume. Here’s a big F YOU! Im not sure how to feel about it. On the one hand MakerBot has to move their business forward and grow their margins and revenue in order to not drag down the Stratasys stock price with their lower, non services driven product lines. On the other hand, the Replicator 2 is a great device with a huge following and, when compared to the current crop of 5th generation MakerBots, still very modern and competitive. Also, as the Replicator 2X is still being made, and with both devices sharing much of the same parts it does not really make sense from any angle outside of a net profit margin stance to discontinue it. 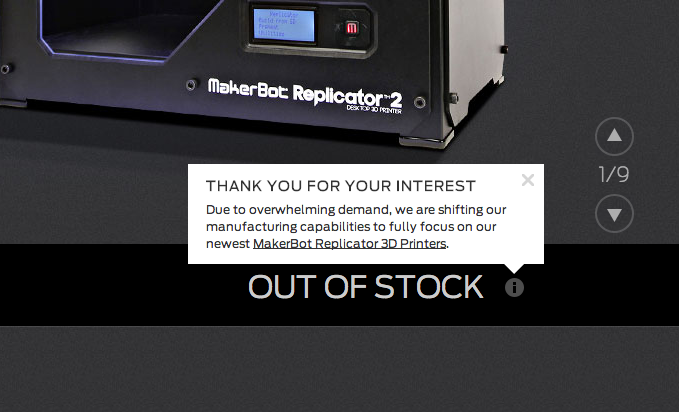 This move Is an affirmation from MakerBot that they believe they will get the sale any way with the new Replicator. They believe that potential customers of the Replicator 2 will not simply go to a competitor for a product more like the discontinued Replicator 2 at a similar or lower price point. I guess Q3 earnings for Stratasys will show if it was a good choice or not. I’m really impressed with your insights about Replicator 2 (I just got one yesterday) and 5th generation product. I also really connected with your assessment of the industry. This technology is pretty disruptive, or will be when it become more like a toaster and less like Arduino (although Arduino is a huge improvement over previous tech in terms of easy of assembly). Your wife’s company, Slingshot is pretty cool. Very nice designs – impressive. I’m an inventor and maker and may need their services some day (although I’m pretty focused on licensing ideas rather than building companies). I would love to hear your insights on Internet of Things. I’m currently working in that area professionally and also creating some new IP I hope to license. It’s a lot of fun! Anyway, it was a pleasure finding your site. Really strange that each of their new products is more expensive than what it replaced though they have better features (if they work as expected). From almost 20 years in the PC business, each generation we introduced was more powerful and less expensive than what it replaced. MBI seems to have this backwards especially with competition that is pretty comparable at half the price.